23 Feb, 1945 : Free French Ship "La Combattante" hit a German mine in the North sea, and sunk. Most of the crew was rescued by MTB 763 & MTB 770. MTB 770 & MTB 763 had been on patrol with La Combattante on the night in question, and Lieutenant Marquis, Senior Officer on MTB 770 had been resting on his bunk, when he felt rather than heard the explosion. On reaching the bridge the Number Three gunner shouted and pointed to the presence of a periscope cutting through the water. 770 gave chase, but with no ASDIC, and with men in the water around whom depth charges could not be used, soon abandoned the chase and commenced rescue work instead. There was no hard evidence at the time, either way, to indicate whether La Combattante had been sunk by mine or by torpedo, and at the subsequent Court of Enquiry into the sinking, the matter of the periscope which had only been briefly glimpsed, was not pressed. However, German records after the war did indeed confirm the ship was sunk by a torpedo fired by a two-man, midget submarine of the Seehund class*. Is it possible to find something similar for MTB 763 ? 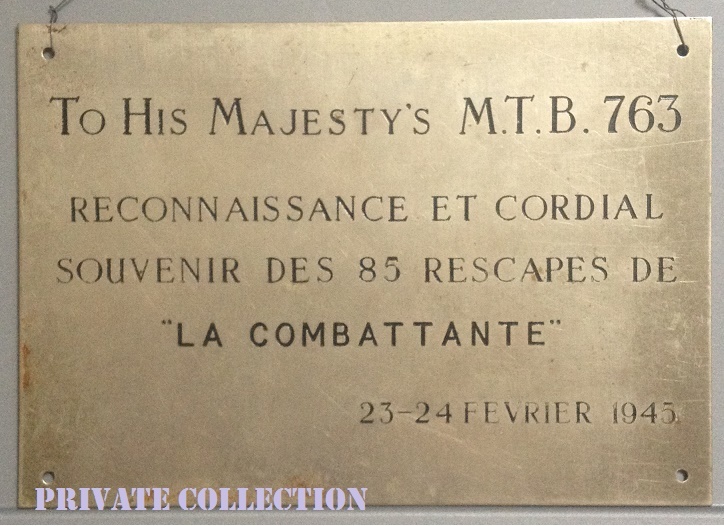 The plaque is a very interesting piece of memorabilia... please find her "sister" for MTB 763. Sorry Herve, I don't have anything relating to MTB 763 at the moment. Thanks for the other plaque. Who has that do you know? If still interested, I have some notes and photos of the "Combattante" sinking given me by one of her survivors, Rear-Admiral (then Lt) Jacques Zang, of the French Navy. I did also correspond with Mr Maquis, though he his letters wouldn't add to your contributions so far. The destroyer's captain, Pepin Lehalleur, was one of those rescued by MTB, along with Zang.